This lovely family owned building is located just minutes from downtown, seconds to Yellowhead Trail, and the bus stops just across the street. You can walk to Safeway just down the street for your groceries. Open the door to your new home, and you are greeted with a spacious entry way featuring a coat closet and entrance to your living room and generous storage room. Proceed in to you large living room featuring quality hardwood style flooring and huge bright patio door leading to the oversized balcony. As you walk into the kitchen, you immediately notice the quality of the cabinetry and the bright open dining area with the natural light of the large window. Once it's time to settle down for the night, you just kick back into the generous sized bedroom featuring full sized closets. What does everyone seem to need? A BIGGER BATHROOM! You get that here too! Your new home has a large bathroom featuring a full sized tub and shower. You have all the storage you will need in the bathroom with the four cupboards and two drawers in your quality raised panel oak vanity and full length counter top. Our newly renovated suites feature a extra deep soaker tub with a cultured marble surround and curved shower rod to create the luxury of a spacious shower. The modest rent includes heat, water and energized parking stalls. 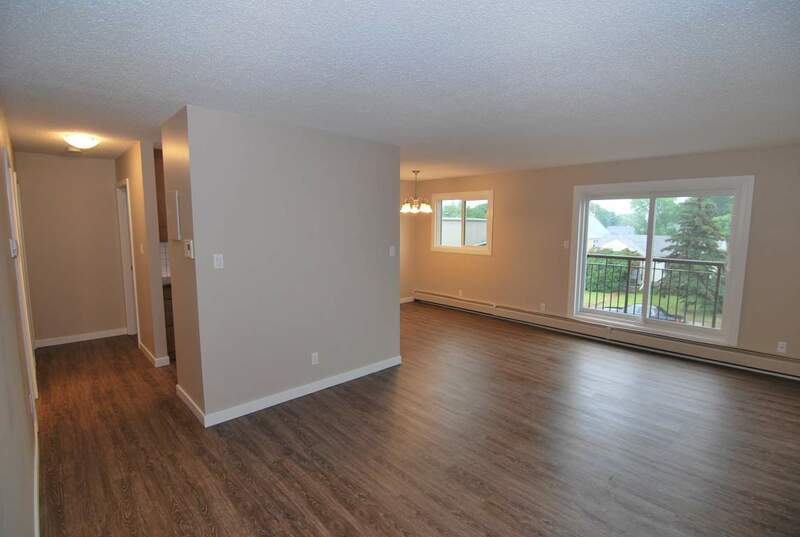 Call our friendly Manager at 780-665-4603 or our office 780-989-0406 for more information and to book your appointment to view this lovely apartment!